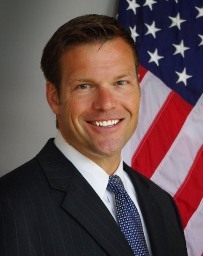 The fierce GOP gubernatorial nomination battle in Kansas ended up even closer than expected on Tuesday with Secretary of State Kris Kobach (pictured) holding a lead over Governor Jeff Colyer by just dozens of votes with some absentee and provisional ballots still to be counted and a recount likely on the horizon. The eventual winner will move on to the general election to face state senator and Democratic nominee Laura Kelly who coasted to a 30+-point victory. Kobach received 40.6 percent of the vote – but the fact that whichever GOP candidate escapes with a win in the coming days will do so with a plurality is not unusual in the annals of Kansas political history. Over the 44 cycles during which gubernatorial primaries have been held in the state since 1910, the Republican nominee has emerged with a plurality in 17 of them (38.6 percent). Nine of these did so with less than 40 percent of the vote. But the headline coming out of Kansas was the razor-thin margin between the incumbent governor and the two-term secretary of state – the likes of which Kansans had never seen. A Smart Politics analysis finds that the less than 0.1-point margin between Kris Kobach and Jeff Colyer stands as the narrowest victory margin across the 88 Republican and Democratic gubernatorial primaries held in Kansas since 1910. Including the 2018 cycle, more than one-third of Republican gubernatorial primaries have been decided by single digits – 15 of 44 (34.1 percent) – with Democrats hosting seven primaries decided by less than 10 points. The average victory margin in the 44 GOP primaries has been 34.7 points with Democratic races decided by an average of 51.7 points. The seven candidates on the Republican primary ballot in 2018 is one shy of the state’s all-time high water mark of eight set in 1964’s aforementioned open seat race between Congressman William Avery and newspaper publisher Huck Boyd. The GOP also had seven primary candidates for governor in 1922 (won by former Lieutenant Governor W.Y. Morgan) and 1986 (state House Speaker Mike Hayden). The five Democratic candidates was also the second highest number of primary hopefuls behind the six who ran in 1934 (won by Topeka Mayor Omar Ketchum) and 1964 (Kansas Corporation Commission member Harry Wiles). Five candidates also ran in 1952 (won by Topeka attorney Charles Rooney) and 1994 (Congressman Jim Slattery). 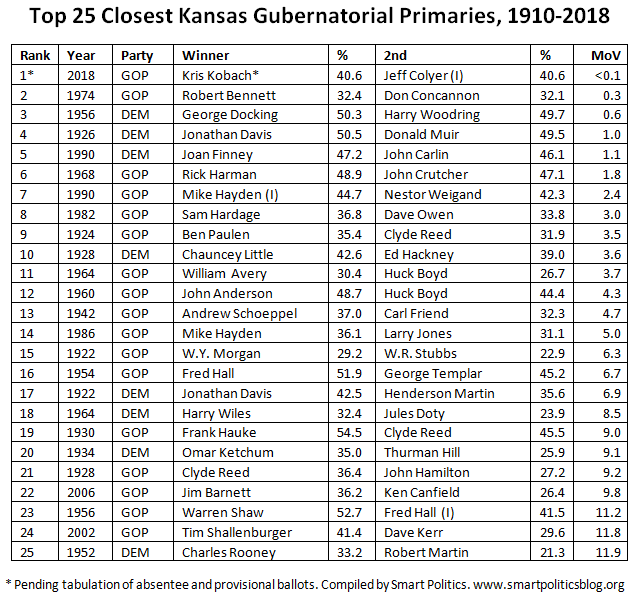 The Republican primaries for governor in Kansas have usually not had a problem attracting multiple gubernatorial hopefuls with only five of the 44 nominees since 1910 winning the GOP nomination uncontested. Each nominee has faced at least one opponent during the last 22 cycles since 1954. Republican newspaper publisher Arthur Capper (1914, 1916), McPherson farmer and publisher Will West (1936), Governor Andrew Schoeppel (1944), and Governor Edward Arn (1952) are the only candidates who faced no opposition en route to the general election. Democrats, meanwhile, have run uncontested nominees in 14 cycles including four in a row prior to 2018 and 11 of the last 19 since 1958. Next: How Often Do Seats Flip in Rematches of US House Special Elections? 1 Comment on "Kobach vs. Colyer Nail-Biter Is Closest Gubernatorial Primary in Kansas History"
1. Kobach is extremely fortunate that a) there is no Instant Runoff Voting (or traditional one w/ a 50%+1 threshold) for the chief executive post, either the general or the primary balloting; and b) there is no statutory requirement that he recuse himself in a highly likely recount. 2. Even if such recount were not to turn acrimonious, the fierce intraparty brawl – perhaps less likely motivated by the traditional Right versus Centre divide than the pro-“45” vs anti-“45” split – would at least modestly augment the odds that the state will have a female as the third successive elected Democratic governor on the 14th of 1 2019.